“You have to teach the dog who’s boss,” is what I often hear when I ask professional dog trainers what the most important thing in training a dog is. When I inquire further they confirm my suspicion that the trainer thinks that he is the boss. Ha! One thing I’ve learned over the years is that the dog is definitely the boss! A study in contrasts. 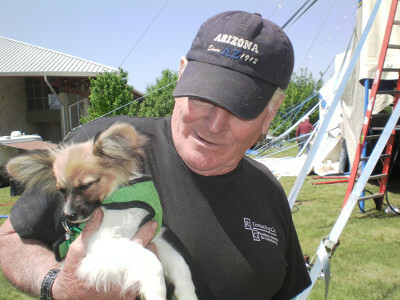 Squirrel, pretty much fully free shaped, being held by Rudy of the Zoppe Family Circus, a traditional trainer who has an amazing circus dog act. Rudy offered to take Squirrel over and over. Sure, you can get good obedience from the traditional techniques of leash jerks, shoving the dog’s body into the “correct” position, and using harsh words. It’s worked for hundreds of years and it still works. But the simple undeniable fact is that there is now a better way, a way for the dog to have fun and learn to do far more than just the simple, sit, down, stay, heel, and come. It’s the Socratic Method for dogs! Free Shaping! But it is helpful to explore what it is about the old-school methods that works in order to show why they should be rejected. The leash jerk and yelling are negatives that the dog will work to stop, and eventually work to keep from happening, though I’ve rarely seen a dog not get a regular “reminder,” justified in this philosophy in order to keep his focus. The trainer using these techniques is basically utilizing the natural instinct to run away from a monster. And the trainer in this case is the monster. Luckily, dogs are smart enough to know the dual nature of humanity, that we can perpetrate evil while justifying the means used with the desired end result. Luckily there is a long history of eugenics at work here, by which I mean we have bred selectively for this trait. Trainers will go on with theories of how they are using the natural order, the way things work in the wild; the pack leader maintains his authority through violence therefore it’s not just justified, but actually mandatory for learning to take place. Some trainers even advocate peeing on things because the dog that gets his smell up the highest is the top dog …. That’s gross; and the mentality that I no longer argue against, at least one-on-one. Before I gave up on talking to these trainers, I would be treated with derision. Obviously there is no way a human with full consciousness could come up with a better method than a wild animal following instincts. The truth is that the dog at every second has free will and I’ve seen highly trained dogs with lots of obedience titles running, as if for their very lives, once they’ve gotten free from these trainers who have way more formal training than me. I never fail to laugh in these cases, thinking to myself, “Who’s the boss now?” I”m actually LOL-ing right now just at the thought. A dog in this situation knows a correction awaits. The irony is that once the dog is with the trainer he should get a treat; a reward for getting caught would increase the chances of a willing return in the future. But no, he’s being punished for something that happened in the past. “Just look at him. He knows what he did wrong,” these trainers will say. But I’m convinced that the dog doesn’t know. That “guilty” look? I’m convinced it’s simple fear-the trainer is mad and the dog would look like that regardless of what he had done. I’ve seen these dogs look that way when another dog is being chased down. A personal story to elucidate this point. One time (ha, this is an ongoing battle) I was trying to get Mouse to stop barking when I let him out in the patio-there is just about always a squirrel that needs to be barked at. I totally had a list of triggers that I was addressing. The thought of going outside would make him bark so I had him in a down as I approached the door, opened it, I walked through, and then I’d call him to me and lie down again before going out the door. Then I released him and grabbed him in a hug as he lunged through the door. I pet him in encouragement at not barking at each stage. Well, I released him, still watching carefully, and sure enough he does his little bounce to emphasize the bark that he’s about to do, and I’m totally lunging at him to grab him before he barks. I’ll pause to mention that my reaction time is incredible, my reflexes finely honed, my eye-hand coordination remarkable even among passers at The Texas Juggling Society where I am known to catch any trick throw no matter how badly executed. 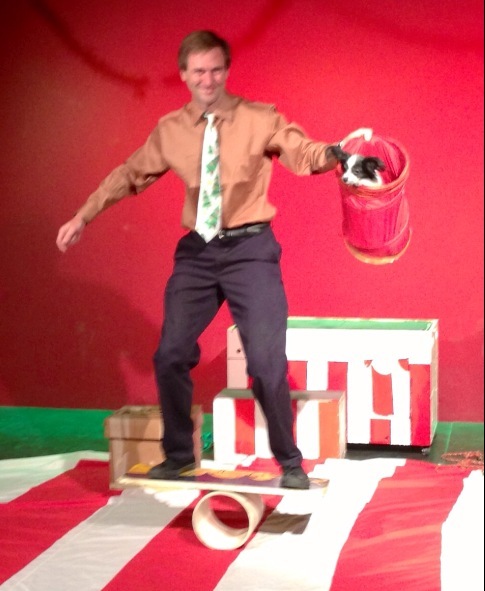 I’ve made my living as a juggler for many years. As we return to the Mouse story, a reminder: I started my correction before the bark even occurred. Well, Mouse did in fact bark as I was in mid leap, lunging at him. He finished his bark, bounced over to the fence and had lifted his leg and was actually peeing by the time I got to him and gave him a poke to redirect him. I could see it in his eyes, or at least projected it, “What am I doing wrong?” I believe there was zero connection between the bark that had occurred less than a half second before and me poking him. Here’s the thing, the only thing one can teach someone is that one is a jerk. Everything else has to be independently learned. Sure, you can get some tips and that is what Free Shaping is all about. It lets a dog discover what you want him to do; this is the opposite of teaching him to not do things to avoid punishers. Trust me, the one thing your dog wants to do in this world is to please you. Just about anytime a dog isn’t doing what you want? It’s because he doesn’t know what you want. This is the very foundation of my training and a perspective that is indispensable in guiding any training plan. 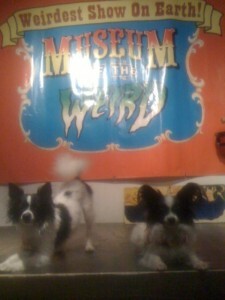 I took dogs to The Museum of the Weird for the first time last Thursday. What an excruciating experience! Normally I blast up there on my super-fun-to-ride $200 motorcycle, park right in front of the museum, perpendicular to the sidewalk of course, because when one does it that way one parks absolutely free(! ), unload the bike, walk two steps into the museum, say a quick hi and head up the stairs. with a light load. Not this time. I had to drive my van, a gas guzzler, find a parking spot big enough for it (three blocks away from the museum), pay for parking (a total of $6 for the night-WAHHHH! ), actually lug my load several hundred times farther than normal, and then up the flight of stairs. I didn’t even mention the torture of having to sit there and talk to every young girl that bent over to pet the dogs. Oh well, that’s why they call it work! Actually, I didn’t mention it because there were no girls, outside of Sahara, soon to be discussed. But it’s worth all of this trouble (to me!) to play with the dogs in a new super-distracting environment. With just Jingles and Skeeter there, I was able to really focus on them. Lately, neither one of them have been getting the one-on-one daddy time it takes to really hone skills, but for different reasons. Jingles, because her routines are already pretty dang good and include a story that I like, a key element to it getting into the show, for sure! Skeeter, because, well, I got him when I thought the world was going to end (previously discussed). Ha ha-actually it’s because, well, I’m going to say it. He was an only dog and wants to work by himself. 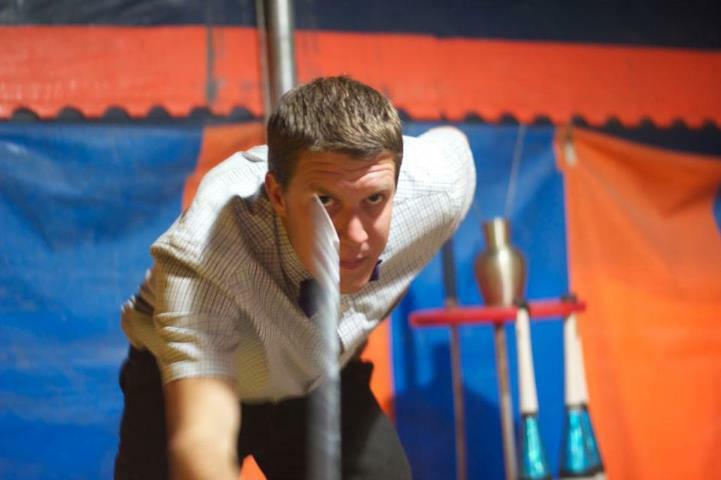 He hasn’t quite joined the family yet-“And Circus is all about family;” an actual quote from Circus Impressario Giovanni Zoppe of The Zoppe Family Circus. I tried to get a picture of Skeeter’s most persistent suitor, Squirrel, to add into the story but even after giving him a bone to give him some focus this is the clearest shot I got. A definite Squirrel, he vibrates at a higher frequency! I think the new puppies will ingratiate themselves with Skeeter. He can almost stand it when they play bow in front of him and he loves having them chase him around the yard. Another reason he isn’t quite in the show? His tricks aren’t all that good. And I’m sorry Skeeter, but this is Circus Chickendog and if you want a solo turn, you’re going to have to have something better than the worst thing that’s currently in the show. Ha ha-no, that one I’m serious about. I’ve actually been working hard with Skeeter on one of my favorite tricks, jumping into my arms. I bridged it in a very calculated fashion (sitting on successfully taller stacks of conglomerations of atoms stacked on a chair) from his wanting to, and very covertly succeeding at, jumping into my lap whenever I was sitting. One of the workers at the museum, who I’ll call Sahara, basically fell in love with Skeeter. I have no idea why. I mean there must be some kind of kismet there. Sahara kept on saying over and over that she was going to steal him-like I hadn’t heard her the first six times. After awhile it got a little creepy and I literally told her that I was considering a restraining order. Let me just say, if only to encourage Sahara to do the right thing, or at least not the wrong thing this one time, by which I mean she needs to restrain herself every second for the rest of her life, I have full faith that Sahara is a good person and I have nothing to fear from her. Sahara, in fact, is wildly popular, works hard, and can expect to win anything her heart desires through diligent focus on her goals. That is the kind of person I really think Sahara is. 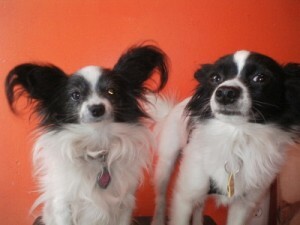 Plus, I was relieved to later learn, she wants a Great Dane so a Papillon is totally inappropriate for her. Skeeter fell in love with Sahara, too. It was like she was his long-lost mommy, which now that I think about it, could be another type-casting on Skeeter’s part. I always think of the owner-surrender, evil person (the person that abandoned Skeeter), as an obese, old, repugnant, smelly, super-disgusting fugitive from society. But I suppose it could be a young, fit, super-friendly, gregarious, accepted in certain circles, certainly not decent ones, ”person,” and by “person,” I do mean to imply that she couldn’t be fully human yet. Ha ha. Anyway, Skeeter had been working on four tricks upstairs on the stage. Jumping into my arms was the big one-the other ones he has down cold, at least in non-distracting environments. When we took a break and we were visiting Sahara, I was holding him in my arms when he did a little growl at someone outside the window. Bam! I put him right down on the ground-it’s just what happens and he knows it. He’s learning to control himself, and as fast as a click happens to mark a behavior, he gets set down when he growls-do what I want and you get a click, something I don’t want? Time out. The rules are clear. He probably came from an indulgent home-you know how little discipline those “people” have-you know the (I want to say “ones” but can’t) multitudes, actually. Finding himself on the ground after his little outburst, he looks up at me for a second and then walks right over to Sahara, who is asking why I put him down, and jumps up into her arms for the first of what I’m sure will be many times; and he does this so adroitly, on this first attempt, that she just instinctively grabs him right out of midair, she’s totally surprised to be holding him, and then there that little miscreant is, right in her arms being cuddled. Guess What Your Dog is Thinking! A Sure Way to be Wrong (but make the right decision anyway)! I am usually the last one to say I know what a dog is thinking. Sure, it’s useful to to take a guess when trying to change behavior and I’ll normally give you that when Moose is looking at a squirrel she’s thinking about engaging with it in some way, maybe just chasing it for the fun of it but I doubt it. I mean she’s never claimed be a pure dogfoodatarian. But after you make your guess at what the dog is thinking and design your subsequent behavior around getting the behavior you want, be sure you’re getting the behavior you want. That’s the holy grail in training-getting the desired behavior. If the dog isn’t doing what you want your program isn’t working. Almost every time this happens to me it is a simple matter of not understanding what the dog’s reinforcement is. A quick example. Often when we are out at the park and Moose is doing exactly what I want and I give her a click to treat her; guess what-Moose cares nothing about the delicious treat I want to reward her with. She is gone-BAM! Chasing that squirrel she’s been keeping her eye on throughout her very obedient sequence of behaviors. She knows, better than me in these cases, that a click ends behavior. 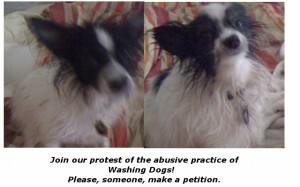 Once you click, you pretty much have to accept whatever the dog wants to do. It can be aggravating, but that’s the situation. This is Skeeter (on the right) with his best friend in the whole world, Jingles. Unfortunately for Skeeter, Squirrel has been licking Jingles’ face lately-and she’s seems to be hating it less and less. 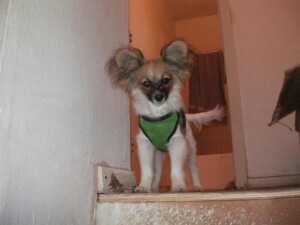 Skeeter was a dog I agreed to pick up on December 19th. As you’ll remember, December 18, 2012 was the end of the Mayan Calendar or something and the world was supposed to end. I chose to believe it. Life was complicated and I had The Mutt-Cracker (SWEET!) hanging over my head. About the only hope I had was that the world would end, what with all of my responsibilities and the typical holiday stresses added on top of it. Believing that the world was going to end meant that I could actually have fun and not worry about the future for once. I could have fun making The Mutt-Cracker (SWEET!) as good as it could be. I could even take the time to go to my cousin’s wedding, which was on December 18th. Since I was sure that the world was going to end I could agree to anything-the joke would be on the universe, right? Well, unfortunately the world didn’t end and I wound up with this owner-surrendered Pappillon. When I got Skeeter he’d been passed around pretty thoroughly. 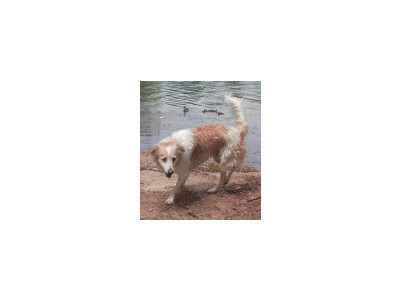 He’d been driven to the shelter, the director’s house, then to a foster’s house, then the shelter director drove him to a friend’s house who then drove him down to the Dallas area where I picked him up and drove him to Austin. Skeeter seemed to like being with me and quickly got adapted to clicker training. I had him doing some group things and he picked up on them quickly, basically doing whatever the other dogs were doing to get treats. 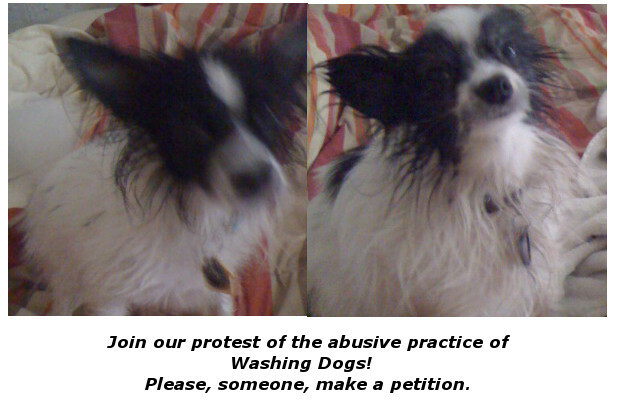 The dogs are now washed, but they are organizing a protest. They would appreciate your support. For quite a while Skeeter was skittish whenever we were in the car, and especially clingy at our destination. My guess was that he thought he was going to be given to someone else and left behind again. Who knows if that’s true, but he did enjoy the extra comforting hugs that he got as my experiment on what to do to make him feel better and more secure! I digress. The reason I bring up this idea of not knowing what a dog is thinking is that I’ve been doing some emergency packing lately and have noticed that Skeeter is watching me especially closely as this has been happening. He is once again getting clingy and I started going through why. Here’s the fantasy that I came up with that might be accurate. The poor little puppy was an only dog, and the owner surrendered him because she was moving into an apartment that didn’t allow dogs. Now obviously that’s the only place on earth that she could move to so I totally understand her giving up Skeeter but here’s the thing-I’ll bet (small sums only, PLEASE!) that Skeeter saw his mommy packing, and it was already stressful, and that’s when his bouncing around to strangers started. My guess is that the poor little guy associates packing with getting left behind. My solution? Lots more one-on-one daddy play time. He’s in my lap right now as I’m writing this. Lots of First of Mays This Year! I can’t tell you how much fun I’ve been having training the new puppies, Coyote and Squirrel, pictured here. 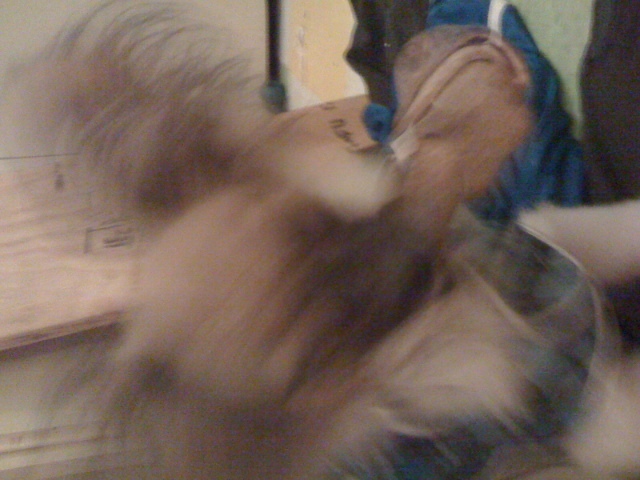 Here Squirrel shows that he has no idea that chewing on costumes against Circus Chickendog policy. It’s always that one trouble maker that you have to write a policy handbook for. 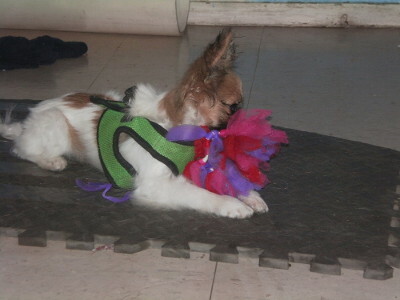 This is Coyote tearing the wrapping paper off of a birthday girl’s prize present. 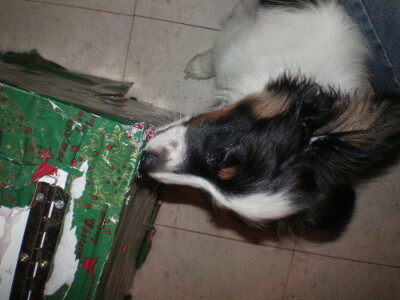 Just kidding, that’s Jingles’ show box that needed rewrapping anyway. But it’d be fun having the dogs unwrap presents right? I mean if it wasn’t by accident. We could do it by “accident” though! This is Rich while working on a sideshow last year, I believe. I don’t mean to insult anyone, and this is just my uninformed opinion, (don’t take this the wrong way! ), but I personally think he’s moving on up. These two puppies have really put a huge hole in my schedule-just the time spent playing with them would be a lot of training, but the thing is, the older dogs need even more one-on-one daddy play time than they’ve ever needed before. Hey, I admit, they have some justification in their jealosies of the puppillons. Ha ha-that’s what we call them around here-they aren’t circus dogs yet! Heck, they aren’t even First of Mays! A First of May is a Circus Rookie-someone who’s on a “Show” for the first time. Notice I say “on” not “in.” Trust me, it’s easy to fall off of a show. Anyway, my buddy, and Mutt-Cracker (SWEET!) partner, Rich, will actually be a First of May starting on May 1st-that is so cool and I am insanely jealous! Good luck Rich, and see you down the road (I really love that one)! I’m sure we’ll be hearing about his adventures as the season progresses. Anyway, it’s all clicker training around here at Circus Chickendog World Headquarters, and if you want to know what super secret techniques I’ve been up to, get ready…..
Here’s the thing, if you can’t get your dog’s attention, no way is he going to even hear what you have to say, let alone actually do it outside of a highly-controlled environment. HA! I laugh at the very thought. Hardy har! Eye contact is the first link in a long chain of foundation skills needed before you have a decent chance of getting your dog under control in a distracting setting. Ok, so that’s the first link in the chain, but I should mention the very anchor point, of that chain. As Squirrel was running around, ignoring the treats in my hand, I started thinking-it’s just what I do when I get bored. At this point in his circus dog career, Squirrel is so ignorant of the world he hasn’t even figured out what food. The money and effort I spend on finding food he wants…..it isn’t worth going into! Anyway, while watching him ignore food, I realized that even before getting eye contact, I need to have a way to ask for it. But first, a guilty admission. What with all the new-puppillon excitement, I’d gotten ahead of myself, teaching the pups to go through a tube for a routine that Rich says will be worth doing (understatement). Coyote was spontaneously running through over and over-it was so funny seeing him looking at me, judging how to get that in my hand treat-he was sure that coming over wouldn’t do it 😉 – then looking 90 degrees, catch sight of the tube and physically jump, startled by….AN IDEA! ; look back at me and then go right through the tube for his click. Then, of course (sorry for the boring part), he got to where he was just going through it like you’d lift your spoon to eat cereal. Squirrel? Not so enthusiastic. I mean he was doing it, but I’d cheated with quite a bit of luring and I felt sullied, knowing that it would come back to haunt me if I didn’t free shape with him. Time was, I thought Coyote was going to be the more mischievous of the two, hence his name, but no, he will listen and consider his actions-ok not a good sign as a predictor of future malfaesence, but Squirrel? That dog is totally at the mercy of every sound, emotion, jealosy, and chemical explosion in his brain as far as I can tell. So I had free-shaped the eye contact, no problem, and I started thinking about how I’d get that eye contact, ie, what is going to cue eye contact? And I was excited to think about this revolutionary idea (it’s so embarrassing to think about this now)! Nobody has a cue for eye contact, right? I realized while working with Moose that, DUH!, the cue for eye contact is the dog’s name. Squirrel certainly fits the original Chickendog’s profile. Poor Squirrel was squealing in severe distress, I ran up the stairs to see him right in this position, stuck at the top of the stairs. I laughed, ran back down, grabbed my camera and took this picture. He pretty much immediately came down after seeing all the other dogs and me disappear around the corner a second time. Trust me, this is the type of stuff I rediscover practically every day; when I’m lucky. When I want Mouse to do his amazing stay-on-me while I do a full back roll, it’s tough to think about simple eye contact. But it does help with everything, the most advanced stuff included-and it may be as simple an explanation as it shows the pup that he can be right. But if he’s distracted by those screaming meteors of cats and dogs coming down at you in the middle of a thunderstorm; and then you can can get their focused attention in the midst of that? Boom! That’s how you huddle up as a team for assignments (RUN! (but this way)) and get out of there. So there you have it. My goal for the week has been for Squirrel to learn his name. 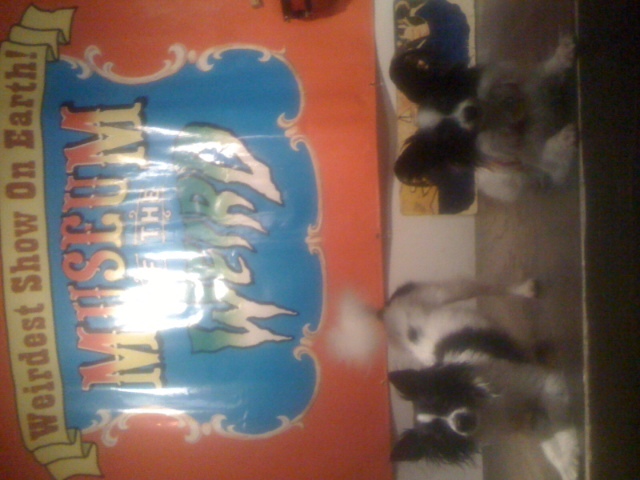 The Museum of the Weird was a busy one last night. My partner and sword swallower, Juan Martinez, brought out his Triple-A Plus material several times as we had standing room only crowds, though Juan claims so many people have fainted during his shows that he isn’t allowed to have anyone actually stand during his performance. Despite my training as a scientist, I refrain from ever asking, “Is that true?” or any similar questioning of veracity. Just accept what you hear in the metaphysical framework of “The Museum,” as it is referred to, is my attitude. I guess I learned that from my listening to the ridiculous speeches that coaches would give, supposedly to motivate my teammates and myself. I would walk out of those team meetings, chuckling at some of the catch phrases that we had been hammered with, look over at a teammate and see them practically crying from shame at disappointing “Coach.” But I digress. This is one of the dogs this guy wanted to buy from me, on the spot, based on seeing them walking by for less than half a minute. What I am thinking about this morning is the aspect of doing the same routine 20 times in a night and the alternate reality of musings that happen after this many shows. Towards the end of last night, right in the middle of a routine, I remember thinking about an interaction I’d had earlier in the day. I’d walked the two older Papillons I have to go eat with a friend and as we were walking back to my place, a character, probably in his 60’s, with shockingly white hair, huge bushy white mustache and eyebrows, and super-countrified appearance, dress, and demeanor (I mean my maternal family farms in Gonzales and this guy would fit right into their circle of friends-now that’s country) said, “I’ll give you five hundred dollars apiece,“ after the younger female he was with expressed interest in them. I kind of chuckled and he said, “I’m serious.” “Oh, I know,” I said, while thinking, “Whatever dude,” as I kept walking away from that type of craziness. The truth is that the dogs I’ve rescued all come with the provision that I return them to their adopting agency if I can no longer keep them. I don’t actually own any of my dogs in a normal sense. And this has nothing to do with my refusal to sell-I simply wouldn’t ever sell an animal. I see selling obviously sentient creatures like monkeys, parrots, and dogs as a form of human trafficking. I find it funny that people make facebook posts saying that they’re against things like human trafficking. Wow, way to take a stand! Anyway, as I was juggling away on stage during one of the last shows of the night, my mind began ruminating on the rest of this anecdote. My apartment is just a couple of blocks away from where I was so rudely accosted with the above malfeasance. I came back out of my apartment shortly after going home and found this piece of white trash and female across the cul-de-sac from my parking lot leaning against his truck looking directly into my courtyard. My street gets lots of people hanging out, so I at first just chalked their being there to the random nature of the universe. But after a half hour of them staying there and looking directly at my building I became alternately concerned and worried that I was being unjustifiably paranoid. Another aspect of my concern was that this guy seemed like the type that would hate being around the immigrant look of my neighborhood-why would he be there? Ok, I know I was entering the world of non-logical visceral judgments so I checked myself-they’re just standing there, nothing wrong with that, right? Well, once the hour mark of them staying there approached and me defending the legality of what they were doing, just standing in the sun, I spontaneously realized that I had a legal right to walk over, did so with them watching me. I pretended to be busy with other matters until I got close, looked up, feigning surprise, and said, “Oh, hey—,” while they kept talking to each other ignoring me. Well, I stood there for a moment until determining that they were purposefully ignoring me, and broke in with an abrupt, “Excuse me,” got continued ignoring, said “I’m sorry to interrupt you,” which finally got the female to make eye contact with me. That got the dude’s attention. “I recognize you from somewhere,” I said to him. “You recognize me?” he said. “Yes, I think I met you at ….” Well, I forget exactly what I said but it was vague enough to be accurate-kind of like what those palm readers would tell you about yourself. I was just trying to get the guy to talk to me so I could look him in the eye and determine further what his soul was like. I mean offering to buy a dog is different from being willing to steal one-not that different, but at least there has to be a willingness from a second party for the trafficking to occur. Ta Da! I just rescued Chickendog yet again! I tell you, the reaction I got from saying I knew him was very immediate, abrupt, and just short of explosive. “We’re done,” he said to me and, “Let’s go,” to the female. A further strangeness is that the female was in a separate car from his truck. They’d driven over separately very shortly after having offered to buy my dogs. Remember, I was juggling during this musing, and I again told myself that nothing had so far happened-as far as I knew. But I felt uncomfortable-maybe my dogs were already in Louisiana. It was a true Schroedinger’s Cat situation. And during all of this musing there was no apparent problem-my juggling was automatic, loose, and included the ingrained flair that I’ve spiced up the routine with over the years. But once I snapped back to that moment’s then-present reality, guiltily going back to full concentration, I immediately bungled a throw causing two balls to collide in the air, recovered, felt relief and congratulated myself on recovering, and then immediately just simply missed an easy catch. This type of concentration issue is a common occurrence for me-probably for everyone. The aspect of thinking about what is being done totally immediately creates a separation from actually doing it. Concentration is actually a distraction. My wandering mind results in no mistakes. It’s a dichotomy I think about often and I’ve recently come to realize that I much prefer the trying to improve while suffering constant defeats in my life over the times that life has just flowed so easily that I don’t bother thinking about what was going on. Four dogs might seem like a lot but they are SOOOO Cute! 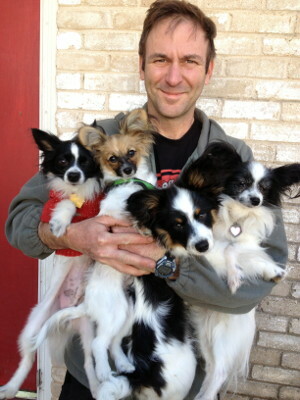 I joke a lot about dog hoarders-I mean why would anyone want more than one dog? Years can be spent getting one dog trained well enough to compete with successfully. One dog is plenty for companionship. One dog is all that’s needed for a best friend. And, in a logical sense, you simply cannot have two best friends. One dog is expensive enough to feed and buy clothes for. 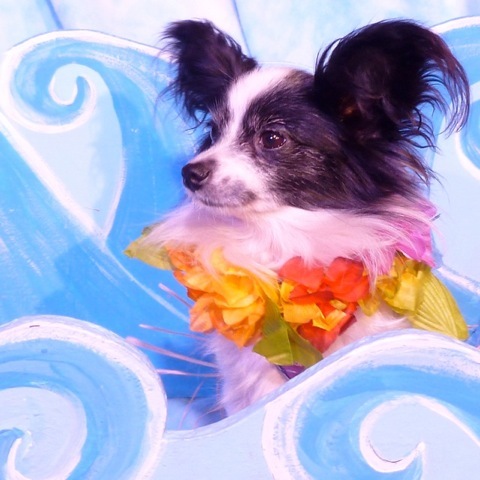 One dog is already too much trouble for most people to run with, a reason often cited for getting a dog, and when the expense of boarding a dog to go on vacation is considered, it is quickly realized that a dog is having luxurious spa days while the owner is struggling with lugging luggage, and borderline molested at airports. And while humans can share rooms at a hotel to cut expenses, that isn’t true at boarding facilities. It may be humane to share a room, but apparently that falls short of being “Dog-mane.” Ha ha. The benefit of getting an intimate perspective on another specie’s perspective on the nature of existence is enough to justify having a dog. I’ll give anyone that argument-heck, I’ll even make it myself. I’ll even admit that a second dog is worth having in order to act as a companion to the first, though I’d have to restrain myself from wondering why a little more time isn’t spent working with and exercising the first dog. But, having more than one dog myself, combined with my fear of seeming like a hypocrite would engage that restraint. I mean, sure, I’m a hypocrite, but I just don’t want to make it TOO obvious. Having interacted once with a female, I’ve learned not to make that type of debate mistake. Ha ha, I kid-I still haven’t learned that lesson, but I know it’s out there waiting to be tripped over again. Anyway, my general lack of a point comes to this: Of course when I got a call from my USDA inspector telling me that a breeder with very successful lineages had so many Papillon puppies that she was looking for good homes to place them in, I paused, thinking about all of the above and also how I already had more dogs than hands to pet them with. And, just so you know, I considered very carefully whether I would even be able to give them that really good home that they deserved, already having five dogs; also considering all the time it takes to work them suitably well to keep them engaged, happy, and constantly learning new behaviors. Then I thought about the amazing juggler I’d seen that could juggle with his feet while juggling with his hands. I mean, the jerk can freaking juggle three balls with one of his (insert disparaging adjective here (l was going to say stupid but know that’s wrong)) feet. Well, having four dogs to play with, I’d already realized that I could be petting dogs with my feet, elbows, tummy, etc, while rolling around with them. And here is my proof that my dogs, even with the two new additions, Squirrel and Coyote, can get all the attention they need. This is quite the easy armload of dogs to carry around. And this is before I even need to start using my amazing juggling abilities or even start using my legs and feet.